Stewart Park is a public park located in the suburbs of Middlesbrough. The park occupies an area of approximately 47 hectares and comprises of mature mixed woodland, open grass parkland and some sealed roads. In October 2009 the Heritage Lottery Fund and the Big Lottery Fund announced that Stewart Park had been awarded a grant of circa £4.4M, This grant award underpinned the proposed £8M restoration of the park. The restoration programme included proposed improvements to the ornamental lakes within the park, including the reinstatement of the lakes to their former sizes and improvements to the planting. The Upper Lakes are a chain of three small ornamental lakes fed from a culverted watercourse sourced from surface water drainage in nearby Marton. There is an additional supply of water from a number of land drains which have been installed in the ground surrounding the lakes. The outlet cascade at the end of the third lake creates a slow current drawing the water from the first lake through to the third lake where it passes through the outlet and is then piped below surface to Ormesby Beck. It was considered necessary to carry out restoration of the lakes and to carry out improvements in land drainage in order to prevent flooding occurring in the future. The lakes were heavily laden with sediment and detritus and it was therefore necessary to dredge the lakes to increase water holding capacity. It was determined that the sediment material was significantly contaminated with total petroleum hydrocarbons [TPH] and heavy metals, particularly lead and zinc. The samples were deemed hazardous as the concentration of TPH’s in all samples was above the 1,000mg/kg threshold stipulated in the Environment Agency’s Guidance Document “Hazardous Waste Threshold for Oily Waste and Waste Containing Oil,” [in accordance with WM2]. The lakes were drained and bypass pumps used to prevent refilling. The sediments were excavated to the required depths and stockpile to allow natural drainage. 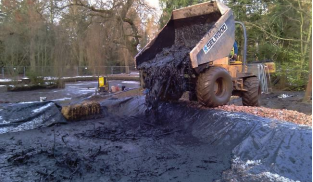 The contaminated sediments were treated in batches utilising a predetermined quantity of E-Clay slurry to treat each batch of sediment. Following treatment the treated sediments were stockpiled and allowed to cure, prior to validation and subsequent reuse. Following successful validation the treated sediments were reused elsewhere on site.